Winter is almost here, and so are TransLink’s winter service changes! NEW trips on the 49, 410, 555 and C28 to reduce overcrowding. This is made possible by shifting service hours from routes with low customer demand. Bigger vehicles on the 188 and C98 serve more customers; conventional buses replace community shuttles on these growing routes. 10 NEW stops for the 116, to better serve Burnaby’s growing Big Bend industrial area. 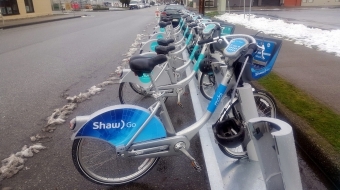 The 404 now ends at Riverport Recreation Complex; passengers travelling to or from the Ladner Exchange can access multiple travel options for various destinations. Visit our Facebook page for more details on how you can enter to win one of three prizes from December 1 to 22. 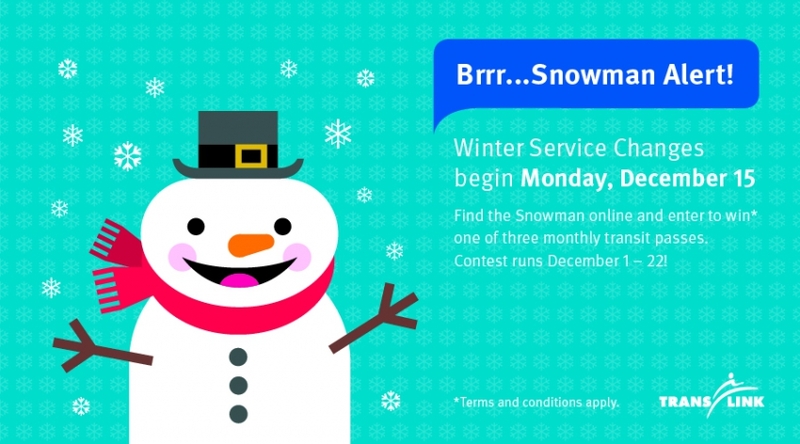 Every morning by 9 am, a clue will be posted to help you find the Snowman icon on the service changes page. 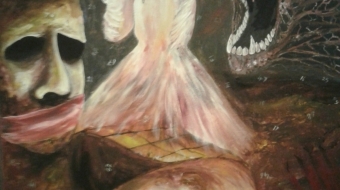 Once you solve the clue, click the Snowman to enter the contest. Using transit this holiday season? A reminder that holiday schedules are in place on Thursday, December 25; Friday, December 26; and Thursday, January 1. Taking transit to ring in the New Year? On Wednesday, December 31, enjoy free rides on all TransLink transit services from 5pm right through until the last trip. Plan your trip before you go, and check for extended schedules on some routes, using TransLink’s Trip Planner. For more information, check out www.translink.ca. Check your route before you go!